(JTA) Though the Jewish community in South Korea is small, Jews visiting the country to compete in or watch the Winter Olympic Games won’t have to skimp on kosher food or Shabbat programming. The country’s Chabad emissary is setting up a pop-up restaurant in Pyeongchang County, the site of the 2018 Winter Olympics. During the Olympics, which start on Feb. 9, the temporary eatery will serve three meals daily, including Korean-style bulgogi beef, schnitzel, hot dogs and vegetarian items. Chabad, a Hasidic Orthodox outreach movement that sends emissaries to countries around the world, will also teach Torah classes and put on Shabbat programming for tourists, journalists and other visitors, as well as deliver food to athletes inside the Olympic Village. “We have big events that we host at Chabad with hundreds of guests, but this is our first time to be able to cater for so many Jews all at once,” Rabbi Osher Litzman, told JTA from Seoul, where he has served as Chabad’s emissary since 2008. There are about 1,000 Jews living in South Korea, according to Litzman. Most are U.S. service members, English teachers, diplomats or students from the United States or Canada who come to the east Asian country for a year of two. 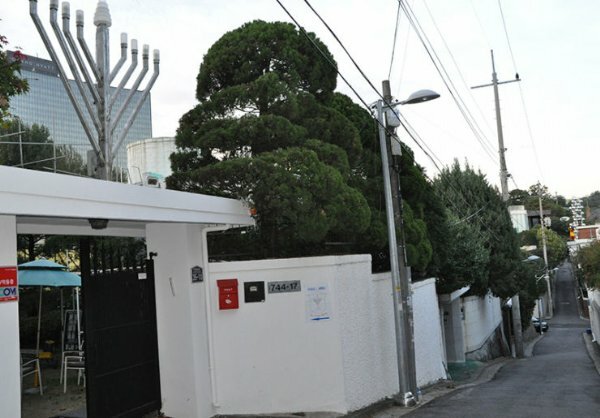 Litzman and his family hosts Shabbat dinners at the Chabad house in Seoul, drawing some 40-50 attendees weekly, and High Holidays programming, which attracts over 200 participants. Chabad also operates a kosher store and restaurant in Seoul and ships kosher food all over the country via an online shop. For Litzman, the Olympics serve as a way to reach more people and expand Chabad’s work in the country. Until the Chabad house opened in 2008, the only Jewish services were at the U.S. Army base in the capital, according to a website for expats. Today, the Chabad house serves as a resource not only to Jews but non-Jews as well. Non-Jewish South Koreans have various reasons for wanting to learn about Judaism, he said. Others, he added, want to learn about the Torah or Talmud, or come because they love Israel or have had positive experiences with Jewish people. South Koreans who want to learn about Hebrew and Israel have another place to go as well: the Israel Culture Center in Seoul. The venue teaches Hebrew and promotes Israeli culture, sometimes holding events with the Israeli Embassy. Founded in 2000, some 3,000 students have studied Hebrew — both modern and biblical — at the center, a representative told JTA in an email. The center also has a Jewish studies library that is open to the public. “Israel Culture Center will continuously work hard to be a place where Israel’s unique culture is introduced to Koreans and significant friendship is being birthed between Koreans and Israelis,” the representative said. South Koreans’ fascination with Judaism has been widely documented. Many South Koreans have a positive view of Israel. Some 800 South Koreans live in the Jewish state, with many more going there to study Hebrew and the Bible. Most of these enthusiasts are drawn to Israel because of their religious beliefs as evangelical Christians. Christianity is the largest organized religion in South Korea, with nearly 30 percent of the population identifying as Christians. Unlike many Chabad emissaries, Litzman said he and his family do not have to deal with safety concerns and anti-Semitism.